I have been traveling the South West the last few weeks and I found myself driving from Texas to New Mexico during the night, not my favorite time to drive but here I was. Driving the desert on a lone highway was not difficult driving. I find that it can actually expands my horizons. I crossed the boarder to New Mexico at sunset, as the darkness of the night covered over me like a blanket of stars I entered Guadalupe County. My destination for the evening was Santa Rosa, New Mexico a desert town that is often called the City of Lakes. But it’s Spanish name is translated as The Holy Rose. The many lakes are made up of limestone sink holes that are connected together through underground tunnels. The largest lake is known as Blue Hole. 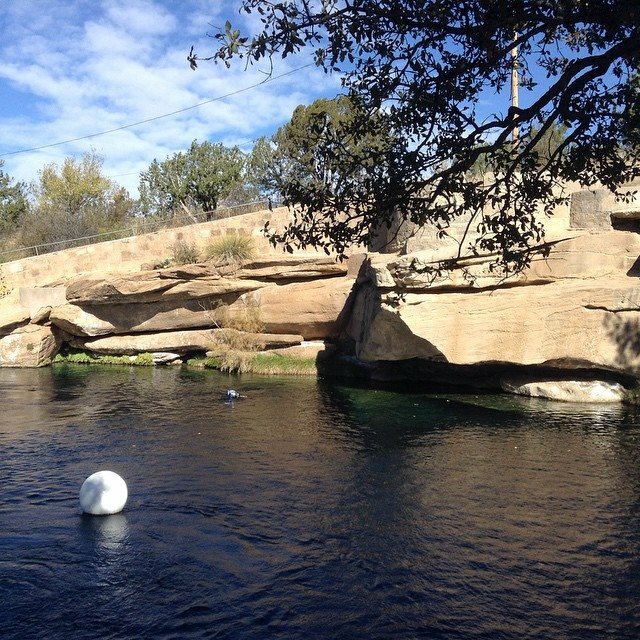 Blue Hole is 80 feet deep and has become a Mecca for divers that want to explore its 61 degree year around water. But let me go back to what I experienced driving the desert that night when I crossed into Guadalupe County. It was dark and not to many cars on the road and I had been driving all day long. I looked up into the desert sky to see millions of twinkling stars and it all of sudden struck me that I was under the mantle of Lady Guadalupe. A deep peace and open heart just came over me as I allowed myself to feel the experience. There is something that happens when a place is actually named for a Spiritual Being. I have experienced this before in places in California. San Rafael, CA. named after the Arch Angel Rafael the angel of healing I found that it was a place where many healers lived and also practice. San Fransico named after Saint Francis who saw the Spirit of God in all of Nature was the beginning point of the Environmental Movement. It was 1970 in San Fransico that the first Earth Day was celebrated. I had the pleasure of attending. So I take note when I come into a place that is bears the name of a Holy One. We came into the town tried from a long drive and got a motel. But on my way inside, I saw a huge rock in front of the motel in a shape of a dragon head….of course the dragon-lines would be here I thought because where there are ley-lines there are all so is a water source close by. We were tried, but we needed a few supplies at the local market on our return to the motel the biggest full moon rose over the town. It was breath taking! Later I found that not far Santa Rose on the Peco’s River the early settlers called the area Gateway of the Moon. I fell asleep that night wondering what I would find in the morning. I heard about the Chapel of the Rose built by Don Celso Baca, the town’s founding father in 1879, for his mother whose name was Rose. It also honored his mother’s patron Saint Rose of Lima. But some say this chapel is the Rose to Lady Guadalupe. But there is also a modern Catholic Church down the street, from this small chapel that is named after the St Rose of Lima. 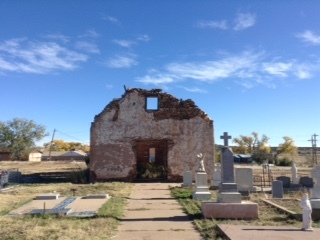 We drove up to an old grave yard and there in the middle were the ruins of The Chapel of the Rose. 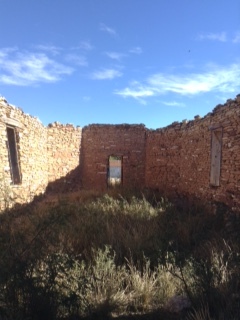 All that was standing were four adobe walls. The Sky was it’s roof and the Earth was it’s floor, for me this was the very heart of Our Lady Guadalupe. Lady Guadalupe is considered a Black Madonna even through she is brown. She a combination of an ancient Aztec Earth Goddess and the original Black Virgin of Guadalupe in Spain. But here in the Chapel of the Rose you could see her true form. Her star studded mantel of the sky and the wild and green vegetation of the Earth was the chapel’s floor. This was a true place to find the Sacred. It made me reflect what was The Chapel of the Rose teaching me? We all live in this form we call a body but when our minds can be a open as the sky and our feet be firmly rooted on the Earth…..this was the true message for me at the very Heart of Guadalupe County.